We may know that e-commerce is a big business that relies on various distributed models and drives consumerism within the market. With growing internet, the e-Commerce Industry has taken a significant shift in strategies over the years. We know that Indian ecommerce services contribute nearly 5% of the retail sales & increase by 15% every year. We are 2nd after the US as they provide 10% of retail sales. Lot has changed within the last five years, and competition is increasing day-by-day and every year. Although low-capital, India is still making progress and emerging an attractive market in ecommerce marketing. 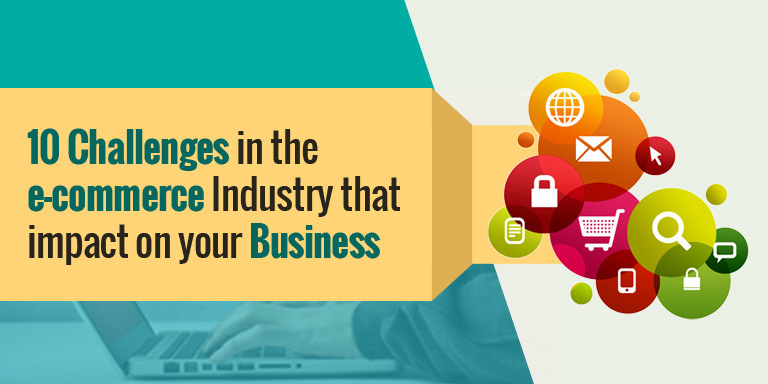 Not only are this there are several challenges that e-commerce industry is currently facing, without wasting much time we’ll straight away jump to what the customer is expecting, what reasons are making them hard to reach the success. As our main motto of any ecommerce service provider, a company is to make the customer happy. Have a look! Solution: If you have your eCommerce application or site then one has chances to foremost this problem and your website might get hacked. As we know that hacker is present everywhere and are experimenting on every startups eCommerce solutions or business. To overcome this problem, you need to check the website on a regular basis and try to fix the errors simultaneously. Solution: This challenge is one of the most common and dangerous problems faced by many ecommerce marketing industries. To resolve this one need to take necessary steps as by using the technological tools. This tool would help in keeping a continuous track over your website and monitor the same every day. Also, if you want to be more specific, then you can use the advanced analytic technology with checking out the problem and getting the desired response. Solution: People may find it hard if your eCommerce applications or responsive design isn’t mobile friendly. This is because in today’s generation users want to shop while on a go which works on their fingertips. One can only do this by opting for the technology such as WordPress to make your site mobile-friendly and adopt various innovative techniques to do the same. Solution: It comes with cross-platform with retention that it will give an adverse problem that is faced at the same point nowadays. This is because there are frequently changed devices and other platforms that will help in an ongoing process with shopping from online sites. To overcome this one need to have a complete understanding of ecommerce services and use the mobile as their medium to drive more customers and finish the transaction process from anywhere. Solution: This is the main reason that you are losing your customer due to increase in competition and market selling products. It comes with one of the most critical factors that will turn your product towards adopting the fact. We merely have to make sure that the customer’s budgets don’t give beyond the planned budget. Solution: Several ecommerce solutions companies don’t add checkout options for the guest or their regular customer who are already using their account on their site. So for this, the best solution would be to ask your expert team of designer and developer to add the checkout button to have mandatory and successful eCommerce marketing service company. Solution: This should not be done as one customer always has to make sure that they advertise about their new arrival or their latest offers and deals with using the social media websites. Users can post on multiple platforms such as Twitter, Facebook, etc. with adding interlinks on the specific parts of the site with showcasing it. Solution: With increasing sales, one can grow along with their business as in the end all that matters most is profit. As many online retailers will always be finding ways to cut the inventory cost, improving the ecommerce marketing skills, reducing the shipping cost with controlling return orders. Solution: With several online partners available, some users face a growth challenge by limiting them to hire the wrong partner to manage their projects. So one needs to oversee the marketing agencies and implement the plans to restrict the growth and choose the retailer very carefully. Solution: AI is one of the most important things that work hand-in-hand with building excellent customer relationships. This allows the customer to use different mode such as selfie mode without ever visiting the store. This is a crucial challenge faced by ecommerce marketing companies nowadays, so one needs to keep up with the trend and integrate it with the market industry. We know that surviving in the e-Commerce industry is quite competitive and has no less than war, so it requires outstanding strategies and some extra efforts for all business aspects. The above challenges would help in building the growth and ultimately help you to have a better chance to bloom shortly. Get to know: How UK based ecommerce company has got winning website? So opt for the best e-commerce industry expert and make your business a grand success just like never before.